Reflections of His Image Where Does Self Life Come From? 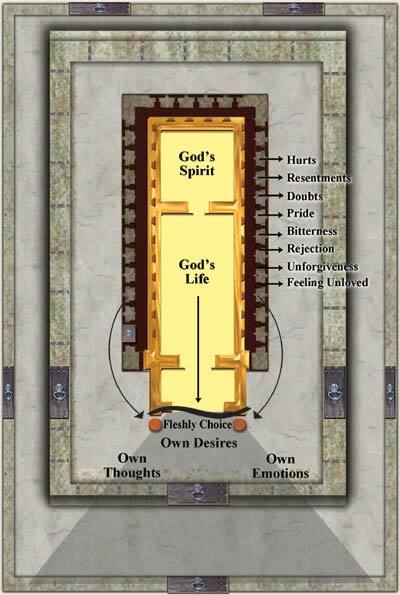 For the last several months, we have been viewing a series of charts on Solomon’s Temple as a model or blueprint of the architecture of man. I would really recommend that you review those previous articles, if you haven’t already seen them, because this issue will build upon them. 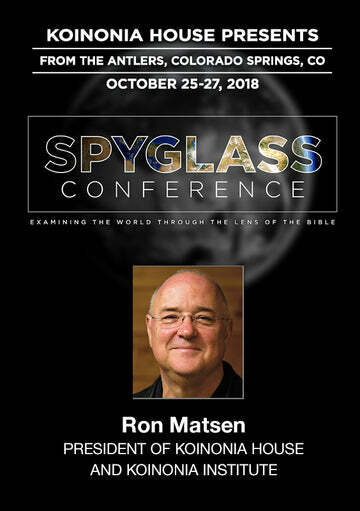 We have been describing what a “spiritual Christian” looks like as he is guided and led by the Spirit of God; and, what a “carnal Christian” looks like as he follows his flesh or his self life (his own natural thoughts and emotions). The question that arises is: if we are believers and have God’s Life in our hearts, where does our self life come from? Where does it originate from? Scripture tells us that when we became “born again,” we not only received a new spirit and a new heart, but also a new willpower. But, our soul and body are not changed, not renewed and not regenerated. In other words, they remain the same. So, “self life” comes from the hurts, the resentments, the doubts, the pride, the bitterness and all the other things that we have never properly dealt with, but have simply stuffed and buried in our secret, hidden chambers which are still a part of our soul. “Self life” is triggered when we choose to follow what this buried debris is telling us to do over what God is prompting us to do. 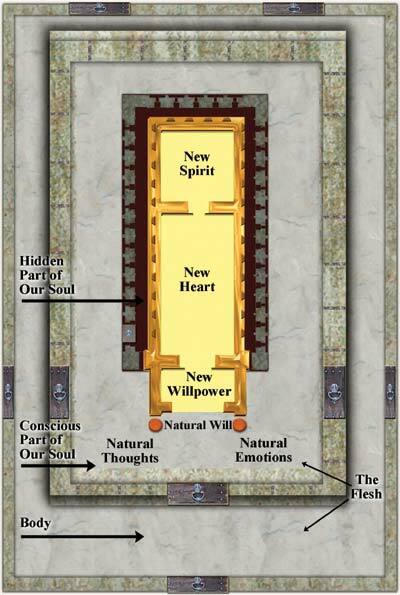 Everything we think, say, and do (good and bad) is stored in these secret, hidden chambers deep within us. God designed the sanctification process to teach us how to recognize this “self life,” how to deal with it and then, how to allow God’s Life from our hearts to come forth. Sanctification is simply the process of restoring the image of Christ in us (Romans 8:29). Many of us, however, have never learned the cleansing steps needed to be sanctified and, instead, have just pushed down and buried much of our pain. Thus, we have given the enemy many footholds in our soul. Therefore, we can be Christians all of our lives, yet because we continue to make fleshly choices (emotional choices to follow our hurts and pain), no one will ever see Christ’s Life in us. His Life will be quenched in our hearts and no one will ever see the difference between our lives and our neighbors down the street who don’t even know the Lord. This is exactly what a “hypocrite” looks like. This is a Christian who “says” all the right things but whose “actions” don’t match his words. He says he is a Christian, and yet his life shows something totally different. He says that Jesus is the answer, but his life doesn’t prove it. This is one of the reasons why the Christian body is having such a difficult time these days. Many of us have become hypocrites-living two lives. Jesus’ Life is in our hearts, but self-life is what is shown from our souls. 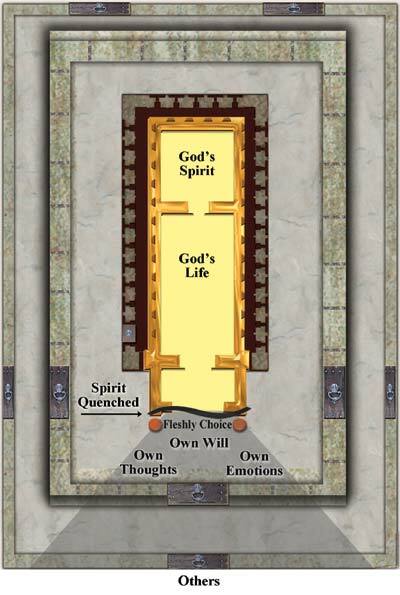 Just as Solomon’s Temple in 1 Kings 8:10-11 and 2 Chronicles 5:13-14 was filled from the inside out with God’s Glory as He came forth from the Holy of Holies, so this is God’s exact will and purpose for each of us. Daily we are to allow God’s Spirit to issue forth from the Holy of Holies of our hearts, fill our souls and glorify God in our bodies. The Bible refers to this infilling and outflowing event as being single-minded or one-souled. Meaning that only one life is being lived here. Because we are clean, God’s Life is able to flow freely from our hearts, filling our souls and producing godly life actions. At this moment, we are living the truth because our words and deeds match. There’s no hypocrisy. We’re not only born of the Spirit, we’re also walking by the Spirit. However, when we don’t choose to put off the sin and self in our lives, God’s Spirit will be quenched and self-life will show forth. At this point, we will be “double-minded” or “twice-souled.” Meaning two lives are being lived here. God’s Life is still in our hearts, but it’s quenched. Thus, “self life” has taken over in our souls. Because we have chosen to follow our own lusts, hurts, frustration, anger, guilt and etc., over what God has told us, God’s Life is blocked and self-centered life actions are produced. The bottom line is that we can be Christians all of our lives, with God’s Life in our hearts, and yet because we continue to make fleshly and emotional choices to follow what we think, feel and desire over what God is prompting us to do, God’s Life in us will be quenched. Thus, no one will ever see the difference between us and those who don’t even believe. Double-mindedness, therefore, is the enemy’s game plan. He will do everything he can to get us to act upon what we are feeling, what we are thinking and what others are telling us, rather than allowing us to make faith choices to follow God. The enemy knows that double-mindedness not only immediately quenches God’s Life in us, it also prevents the Gospel from being passed on. Jesus’ Life is the Light that Luke is talking about here. Our goal and purpose as Christians is not only be to be filled with that Light, but also to let that Light shine forth to others. As Psalm 80:1d says, Thou that dwellest between the cherubims, shine forth. We’re not to hide that light under a bushel (“self life”), but put it on a lampstand where all can see it. Review Chart 3. This passage in Luke says that when we are single-minded, we will have a body full of light (i.e., Jesus’ Life will exude from us like a flashlight). His Life will be on a lampstand where all can see it. This is a picture of a spiritual Christian who has put off all his own sin and self, and has put on Christ, thereby glorifying Him in all he does. However, if you review Chart 4, you’ll see a double-minded, carnal Christian who has a body full of darkness. This Christian is not dealing with his own sin and self, and thus, he is not reflecting or glorifying the Lord. He has chosen instead to hold on to his hurts, resentments, bitterness, anger, etc., and these things have quenched God’s Spirit in him. At this point, not only is all personal communication from the Lord blocked, but this blockage also causes him to be personally insensitive and unfeeling towards others. This is why many of us are forced to live a lie and why we so often end up wearing masks and facades. We can’t let others see that it’s not really working for us. This is also why so many Christians get tired of playing at being Christians. They have worked hard at living Christ’s Life for Him-copying Him and imitating Him-rather than simply surrendering their “self life” and letting Christ live His Life out through them. 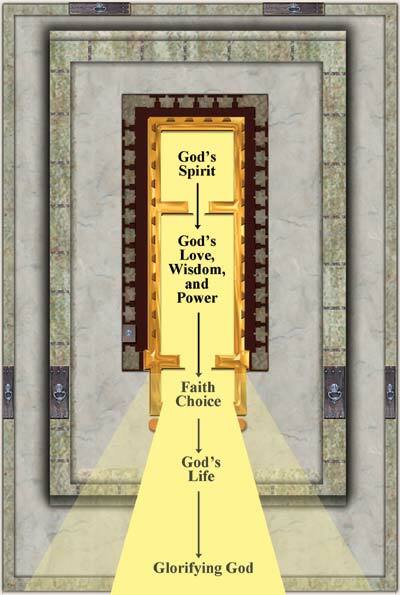 To be continued next month: “The Importance of our Choice.” This article has been excerpted in part from Nan’s new book, Reflections of His Image: God’s Purpose for Your Life. October 2007 Personal Update News Journal.